Fox 2000 Pictures and Metro-Goldwyn-Mayer Pictures have revealed the first poster and trailer for the upcoming remake of the horror film, Poltergeist. The new version was directed by Gil Kenan and stars Sam Rockwell and Rosemarie DeWitt as parents whose new home is the target of supernatural activity, with Jared Harris playing an Irish ghost hunter who shows up to investigate the unnatural occurrences in the home. A contemporary version of the 1982 hit horror film, this new Poltergeist was written by David Lindsay-Abaire and produced by Sam Raimi Robert Tapert, and Roy Lee. 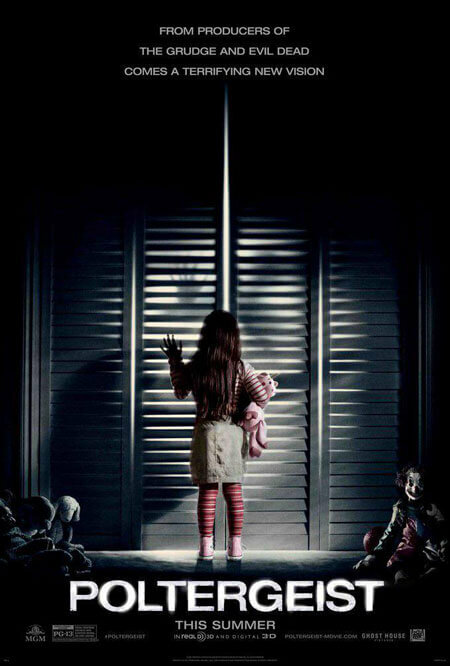 Poltergeist opened in theaters on July 24, 2015. Filmmaker Sam Raimi and director Gil Kenan contemporize the classic tale about a family whose suburban home is haunted by evil forces. When the terrifying apparitions escalate their attacks and hold the youngest daughter captive, the family must come together to rescue her before she disappears forever.